Dr Seuss makes us think of everything rhyming! Cat in the Hat, Green Eggs and Ham and many other favorites! 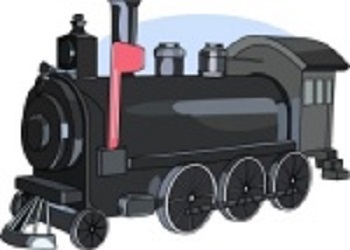 You can either scroll down through this page to see all of the preschool activities. 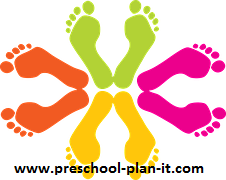 Or, you can click the link below to go to specific preschool activity types you are looking for. Materials Needed: Fingerpaint and paper! The children make footprints, one of each color. Allow them after that to sit on a chair and just "paint" with their feet! This is a great followup activity to The Foot Book ! Materials Needed: A variety of colors of paint, brushes, and half sheets of construction paper. Encourage the children to use one color on each half sheet to make their own color book. VARIATION: Let the children experiment mixing colors while they paint. This is a great activity to go with the book My Many Colored Days ! 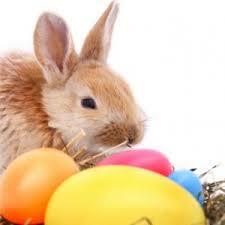 Materials Needed: One grocery bag for each child and items to decorate it! 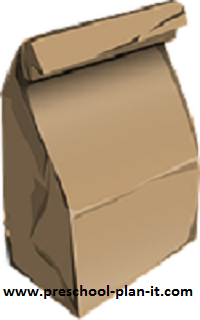 Roll the paper bag so that it fits on each child's head. 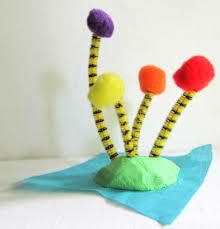 Let them decorate by painting or by glue on some crazy Seuss-like items: chenille wires (pipe cleaners), stickers, fabric, etc. You could also use this activity to work on patterns with the children. In advance, draw bold stripes on the bag with a dark marker. They can try to create a patterned hat using each striped area. Provide paint, glue and feathers for the children to make their own Gertrude McFuzz hats! Materials needed: red and white paper, paper plate (with the middle cut out). The children use the paper to make layers to see how high they can make their hats! This following is a great followup to the Dr. Seuss's ABC Book ! Materials: Provide a large variety of recyclable items (boxes, water bottles, etc. ), arts and crafts materials (ribbon, yarn, google eyes) and glue. 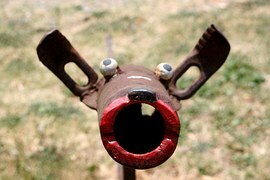 Encourage the children to make their own creature and name it! I'm not sure where the image is from, let me know if you do! Use playdough and provide pipe cleaners, pom poms, glue and other items. The children can make their own Trufulla Trees after reading The Lorax ! Materials: Wooden unit blocks, foam blocks and any other blocks you want to add! Can your children balance as many items as the The Cat in the Hat did? Try adding stuffed animals and see how high the blocks can go to balance them! Add zoo animals (stuffed or sorters/counters) to your block area for your children to build a zoo. Be sure to include the book If I Ran the Zoo in your Block Area for your children to read! Materials Needed: In advance, record the animal sounds from the book Mr. Brown Can Moo, Can You . As you read the story, stop and play the voice! VARIATION: Ask a parent to record the sounds! VARIATION: Prior to this theme, record the children making the sounds and don't tell them why! When you have this theme, pull out the recording! They will LOVE hearing their own voices! After reading The Foot Book (The Bright and Early Books for Beginning Beginners) to the children, help introduce them to left from right by reciting the page "Left foot, right foot" etc. Follow this up with a foot art activity! Materials Needed: A large sheet of paper with the names of all of the Dr. Seuss books you've read with the children this week! At the end of your Dr. Seuss Theme, have all of the books you've read out for the children to look at. Encourage the children to print their name on a piece of paper. If they are not writing their names yet, have papers with each child's name available. Give the children their name and a piece of tape. Have them place their name next to their favorite Seuss book. Is there a class favorite? Which book was enjoyed the most? The least? In advance, ask the children what they would wish for if they could have any ONE thing they wanted. Read this I Wish That I Had Duck Feet (a story about a boy who wished he had something different!). Follow up by encouraging the children to draw a picture of what they said they wanted! Snack Recipe Ideas to Cook Up for Your Dr Seuss Theme! Green Eggs and Ham, of course! First, read the book Green Eggs and Ham to the children. 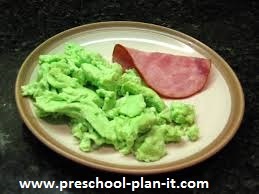 Then, make some scrambled eggs and add some green food gel to the eggs before cooking! Materials: Pull out your dress up clothes and props such as hats, scarves, shoes etc. Also, place a large variety of Seuss books out. Encourage your preschoolers to dress up like the characters in the book! Set up your kitchen set! Make some green eggs and ham out of felt pieces. Materials Needed: green paint, white paint, rectangular paper OR actual shoe box lids! Make different shades of green. Painting on a shoe box or other box lid helps Sam I Am to "eat them in a box"! Dr Seuss Theme Large Group Games to Help Your Preschoolers Build Their Muscles While They Have Fun Together! Place a line of wooden unit blocks in a row to use as a balance beam if you don't have one. Use bean bags and balance one: on your head, on your elbow, one your back, on your foot! Pin The Hat on the Cat! Thank you Esily from Greenbelt, MD for this idea! Materials Needed: Blown up picture of the Cat in the Hat. The red and white hat that can be taped to the cats head. Or, How about a Pop-Up Version??! The Lorax Pop-Up! Dr Seuss Theme Math Activities to Help your Preschoolers Develop Their Math Skills and Those Small Muscles in Their Hands! Materials: construction paper, marker, scissors and rulers! Encourage your children to trace their foot and cut it out. They can use these cut outs to measure everything in the classroom--the chairs, tables, their friends! Also provide rulers so they can measure with them as well. Materials: Strips of long construction paper (about 2 inches wide and long enough to be a headband! ); artificial flowers, glue. Encourage children to create patterns with the flowers and foliage and glue it to the strips of paper. When dry, they can wear their Maisy Headbands. EXTENSION: Provide large wreaths (purchased at a craft store or donated). The children can place the flowers in the wreaths. You can either hang the wreaths or leave them in the manipulative center for the children to use all week. Materials: Colored Goldfish snacks and bowls. Give each child a handful of colored fish for them to sort and count.....and, of course, EAT! 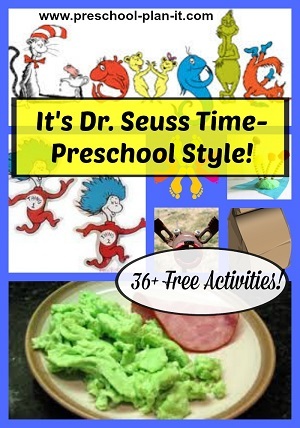 Dr Seuss Theme Music and Movement Activities and Ideas to Get Your Preschoolers Movin' and Groovin'! Sing and act this song out in honor of The Foot Book! EXTENSTION: Provide foot movement activities for the children: Kicking balls, "tap" dancing, jogging, running! Dr Seuss Activities for Your Sand and Water Table! Mix equal amounts of cornstarch and water into your sensory table. This is the greatest texture! It is hard when you touch it. When you scoop some up, the heat from your hands melts it and then it hardens again! Make your own Bartholomew Oobleck! You will need: 2 cups of water, 1 cup of glue, 2 tablespoons of Borax (it is found in the laundry detergent aisle). Mix 1 cup of the water with the 1 cup of glue. In a separate bowl, mix the remaining cup of water with the Borax and a few drops of food coloring if desired. Pour the Borax and water mixture into the glue/water mixture SLOWLY while stirring. Once it becomes rubbery, stop pouring in the borax mixture! Pour off the excess liquid and let the kids enjoy using this! Remember, this WILL stick to clothes, hair and carpeting! Children count how many teeth they have and write it on a paper. It is fun to compare! Who has all 20? Has anyone lost teeth yet? Writing Activity Ideas for Your Preschool Classroom's Dr Seuss Theme! To go along with the book The Shape of Me and Other Stuff, provide shape stencils in your writing center for the children to trace and decorate. After reading Marvin K. Mooney, encourage the children to draw where they would go. Provide colored pencils and white paper and perhaps some Dr. Seuss stickers! Click the picture below to check out a very inexpensive box of 255 Dr. Seuss Stickers from Amazon! Miscellaneous Activities for Your Dr Seuss Theme! In advance, send a notice home for your children to come to school in their pajamas AND wearing crazy socks! Read A Great Day For Up and Fox in Socks to start your day! Happy Birthday, Dr. Seuss Theodor Seuss Geisel- was born on March 2nd, 1904. Have a birthday or UN-birthday party in his honor! Our Foot Book Thank you Linda from Brooklyn, NY for submitting this idea! We made a class book using Oh the Places You'll Go and The Foot Book. After reading these books, we sent construction paper home for the parents to trace the children's feet. When they returned the papers, we documented all the places their feet have taken them. The children really enjoyed "reading" their own book after we finished! How Many Yertles Tall are YOU? Thank you to Kierstyn for this idea! We are reading Yertle the Turtle. I made 14 "Yertles" and stacked them out in the hall as a height chart. Students get to measure how many Yertles tall they are and stick their picture by it. Don't forget to sign up for my free club and receive oodles of activities and a full week's theme each month! You'll also receive my weekly newsletter, free downloads and more!